Are you often confused by the term “Deuce” which is usually used in the game of tennis? If you are a new tennis player or a person who is just getting to know about tennis, then this is a perfect article for you. 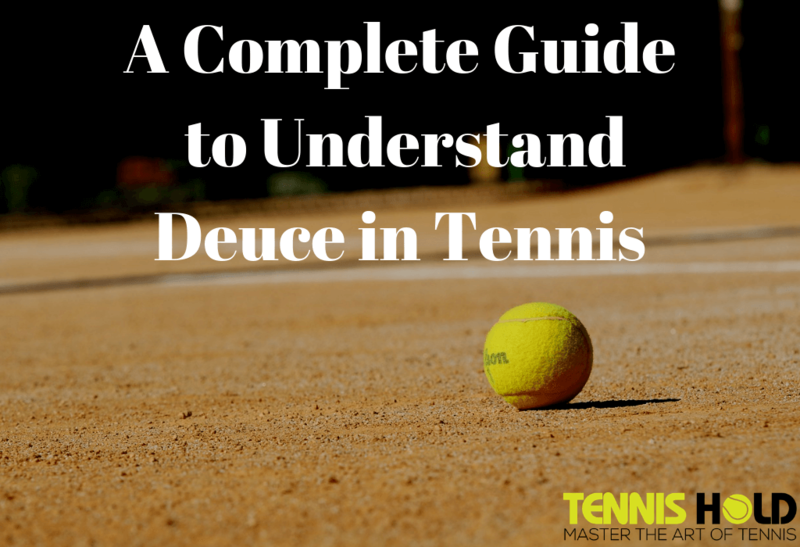 We are writing this complete guide that will help you to better understand the term “deuce”. Deuce is often one of the most confusing terms used in tennis along with “Love” in tennis. We have already covered a lot more about the term “Love” in our previous article. In this article, you will know about the term “deuce” in more depth. So, I recommend you to read the whole article to understand this term properly and to broaden your knowledge about tennis scoring system. What Score Is Deuce in Tennis? What Happens After Deuce in Tennis Match? What is the Relationship of the Term Love and Deuce in Tennis? How Many Deuce are Allowed in a Tennis Match? How to Play Deuce in a Tennis Match Perfectly? What is the Longest or Highest Deuce in Tennis? What is the Definition of Deuce Court in Tennis? What is the Relationship of Ace and Deuce in Tennis? Is There Deuce in Doubles or Mixed Doubles Tennis Matches? What is the Deuce Probability in Tennis? What is Sudden Death in Deuce Tennis? Many people wonder that what could be the true definition of deuce as far as the tennis game is concerned. According to the etymology provided on English Language & Usage Section of Stackexchange, in the medieval French, a clock face was in use for the scoring purpose. In that time, a French term named as “a deux de jeu” was used for the score of “40-all” or “40-40”. This was intended to display the meaning that the game was just two points away from its end. There is another meaning in French dictionary for Deuce which is “Deus”. That term simply means “Two” in English language. We can also infer from this meaning that there is an equal score in the form of “40-all”. And now both the players have to win two consecutive points to win the game or two consecutive games to win that particular set. Therefore, if you want to know the literal meaning of the term “Deuce”, it simply means “Two”. And if you want its true meaning regarding the tennis game, then you can say that you need two consecutive points to win the game when the term deuce is used during your actual tennis match. Because deuce is used only when your score and your opponent’s score is equal to 40. That means tennis score at that time is always “40-40”. From that point onward, whoever wins two consecutive points, wins the game or whoever wins two consecutive games, wins that specific set. In the game of tennis, if your score and your opponent’s score reaches 15 at the same, it is called as “15-all”. Similarly, if your score and your opponent’s score reaches 30 at the same time, then it is also called as “30-all”. But when your score reaches 40 and your opponent’s score also equals your score, then it is not called as “40-all”. At this point, this score is called as “Deuce”. So, basically the score of “40-all” or “40-40” is known as deuce in tennis. From this score onward, you have to win 2 successive points or games to win the game or set in tennis. If both of the players reach the same score again from this point onward, the tennis scoring system keeps on displaying “Deuce” only. Till you or your opponent wins two successive points, this same scoring system goes on. When the game of tennis reaches the score of “deuce” that means “40-all”, you just have to win 2 successive points to win the game and 2 consecutive games to win that set. If you are a server and you win the first point after deuce, then your score is called as “ad in” or “Advantage in”. And if you win one more point after “ad in”, then you win that game point. On the other side, if your opponent wins the first point after deuce when you are a server, then that score is called as “Advantage Out” or “Ad out”. And after “ad out”, if receiver wins again, then he/she wins that game. However, when you are a server and you win the first point that means it is “ad in”. But if your opponent or receiver wins the next point, then the score again becomes “deuce”. And after this, you need to repeat from “40-all” onward. For more info, please refer to this Reilycenter article. As far as the term “Love” is concerned in tennis, it simply means the score of “zero”. For more information, please refer to our article about Love in Tennis. On the other side, the term “Deuce” is used for the score of “40-all”. It also means two in French etymology. If the score in tennis is “15-0” then it is also called as “15-Love”. Similarly, for the score of “30-0”, it is called as “30-Love”. But when the score is tied at “40-all”, it is often called as “Deuce”. So as far as relationship is concerned in between the term “love” and “deuce”, there is no direct reference to each other. But yes, you can say that deuce is often followed by love. A tie often comes after the score of zero in tennis. If the score is “40-0”, then it is known as “40-Love”. But when the tennis score is 40 for both players, it is not called as “40-all”. At this stage, the tennis scoring system displays the score as “deuce”. Therefore, there is no direct relationship between two terms. But we can say that one follows after the other (deuce comes after love). As far as exact number of deuces allowed in a tennis match is concerned, there is no fixed or definite number to it. Till one of the tennis players wins first two consecutive points after first deuce, the match continues or goes on. If you are a server and you win first two successive points or sets, then you win that set or a game respectively. Otherwise, a returner or your opponent wins first two consecutive points after deuce, then that player wins the set and similarly a game. So, if you want to know how many deuces are allowed in one tennis match, then the answer to this question is indefinite. Till someone wins first two points after deuce, the match goes on and on. But it has often been observed that after first deuce, it has rarely gone up to 6-7 deuces in one match. Before moving further, I highly recommend you to watch the following interesting video where the presenter provides very good knowledge about what is deuce and how many deuces are allowed in a match. He has also explained well regarding the gameplay tactics when deuce happens in a match. If you want to know how to perfectly play deuce, then this is a good starting point. When you are facing deuce condition in a match, it becomes mandatory for you to win two successive points to win that game and two games to win that set. Suppose, your score in a match is 6-5 which means you have won 6 games and your opponent has won 5. Then, your opponent has to score 2 more games to that set. And if the match score is 6-6 which leads to tiebreaker situation. After this, you need to adopt different gameplan for winning that tiebreaker. But it sometimes happens that deuce game could go forever and you could face some difficulty to overcome this deuce situation. In this case, if you are playing deuce repeatedly for more than 10-15 minutes, then you would have to become either aggressive in your gameplay or you would have to take cautious approach to wait for your opponent’s mistakes. Either way, playing a minimum risk tennis or taking a cautious approach provides greater opportunity and rewards you as a tennis player. Whenever you are near the end of the game and it is getting closely contested, it is always a wise strategy to adopt minimum risk gameplay techniques. If you follow this strategy and play deuce in tennis this way, then you obviously increase your chances to win that game and the set respectively. For more of such tennis playing tips, I recommend you to read this article from Optimumtennis.net. According to the article on TheGuardian.com, the highest number of deuces in one tennis match was 37. This was literally the wold record which has not yet been breached by any tennis player in the history. This tennis match was played in between the famous players named as Anthony Fawcett and Keith Glass. It was played on 26th May 1975 at the Surrey Grass Court Championship Tennis Match which was located in Surbiton, UK. Keith Glass won this match after 37 deuces happened in a match. This can definitely be considered as the longest deuce in Pro Tennis History. It literally required 80 points to win 1 single game in that match. 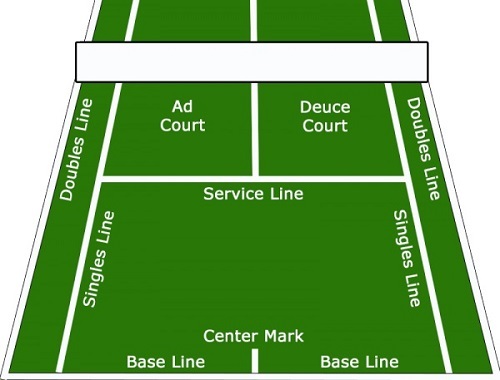 According to the definition provided on Dictionary.com, the actual meaning of deuce court in tennis is mentioned as the receiver’s right-hand service court. This is the part of tennis court where usually your opponent serves the tennis ball at the time of deuce. Here ad court (Advantage Court) and deuce court are the two tennis terms that are used in case of deuce situation. Ad court is usually considered as a left side of the player and the deuce court is considered as the right side of the tennis player who is serving when it is deuce. At the right side of the player, the deuce points are often played. The left and right side is usually decided on the basis of right and left direction of the center hash mark of the court. In the beginning of the game, you are always on the deuce side of the court. And also, when the scores are equal like 40-40 or when scores are even, you can consider yourself playing on deuce court. Similarly, when points are odd numbered, then consider yourself playing on the ad court. For more clarification, please refer to this Tennis-Warehouse.com discussion. If you want to understand the overall deuce tennis court construction methodology, then you must first have to have a good overview of deuce tennis court diagram. Here is the basic tennis court diagram for your reference. All other tennis court dimensions are same as your regular tennis court. For more detailed information about exact tennis court length, width and other parameters, please refer to our complete guide about tennis court dimensions. Ace is basically a tennis term which is also known as a winning serve which is not touched by your opponent. This can also be termed a legal serve by the server which is not touched by the receiver. This obviously provides a winning point for a server. As far as deuce is concerned, we have already discussed above that it is a tied score of 40 on both the sides. And for any relationship between ace and deuce is concerned, there is no direct relation between the two. But we can surely say that ace can be followed after deuce is happened. Two consecutive winning serves can help you win that particular set or the game point. As far as doubles or mixed doubles tennis matches are concerned, USTA and ATP have already introduced No-Ad scoring method. This means there will be no deuces in these types of tennis matches. There is no third set to win in these matches. Instead, there would be a 10-point tie breaker scoring system. This is one way to finish doubles tennis matches faster and without delaying them unnecessarily. Every one of these matches now involve only four points. Whoever scores these four points first, wins that game. In case, both the sides score three points at the same time, then instead of deuce, you just have to win the next single point to win the game. The receiver team usually decides the court for the service delivery. So, this is more or less a tennis doubles deuce deciding point. For more mixed doubles tennis rules, please refer to this Berry.Edu PDF. This is one of the most interesting questions asked by many of our readers. Therefore, we decided to find the answer to this unique query. So, after careful research, we found the answer at Austinrochford.com blog. According to his research and analysis, the author has found out that in a tennis match, when the player wins a single point with probability of 0.6, the probability of winning that game after deuce, becomes approx. 0.69. On the other side, if the probability of winning the single point reaches to 0.75, the probability of winning that game after deuce reaches to 0.9. This is 20% increment in probability of winning the game when deuce happens in any tennis match. It’s an interesting theory and observation performed by the author and we really thank him for his arduous efforts. Sudden death is also known No-Ad scoring match. As per above discussion in the section of deuce in doubles tennis match, it is very clear that there is no direct deuce concept present nowadays in doubles and mixed doubles tennis matches. You only have no-ad scoring method or also known as “Sudden Death”. In sudden death matches, the team who wins consecutive four points first, wins the game. If deuce happens or scores are tied, then the first team who wins a point after that deuce, is declared winner of that game. For latest sudden death rule changes done by ATP, check out this Eurosport.com article. We have reached the end of this complete guide about Deuce in tennis. Till now, we have understood the real meaning and exact tennis scoring system as far as the deuce concept is concerned. Many new tennis players and enthusiasts were asking that what happens after deuce in a tennis match. We pretty much covered this query in good detail. We have also studied the exact relationship of “Deuce” with the tennis terms such as “Ace” and “Love”. How many deuces are allowed in a tennis match was the question which many users were asking online. We have also provided the answer to this query. Many new players fail to handle deuce properly in a match. Therefore, we have mentioned some useful techniques and tactics to learn and implement to improve your gameplay. In the end, we learned more about the longest or highest number of deuces in a tennis history. Then we also delved into the definition of deuce tennis court and its diagram. In the final section, we touched upon the topics such as sudden death, no-ad scoring, and deuce probability in a tennis match. So that’s it guys. I have done my best to cover all the possible topics regarding deuce in tennis. If you like this complete guide, then don’t forget to share it with your friends and other tennis players.